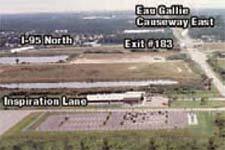 of Interstate 95 (I-95) and Eau Gallie Boulevard in Melbourne, in Brevard County, Florida. lots as it reduces the need to provide expensive on-site parking. Employers can also save money on payroll taxes by providing employees tax-free transit and vanpool benefits. For more information, call 321-952-4563 or E-mail us!